With our firm commitment to meet and stand tall on the expectations of our large number of clients spread across the country, we are instrumental in offering them a wide range of Holo Shrink Sleeves And Labels. This range offered by us are provide long lasting impact and are delivered in flawless forms to our dearest clients. In addition to that, complying with the latest market trends, our range has customized specifications that again has very excellent deign. Moreover, price for the offered products is very reasonable. 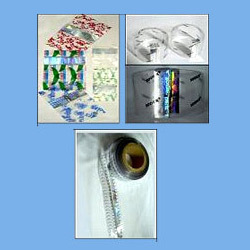 Hologram-med Shrink Sleeves/Shrink Labels that we offer to the esteemed clients are of excellent quality are offered to the clients only after these are tested on varied quality parameters laid by the organization. In addition to that, range that we offer has been the outcome of our domain knowledge and followed by this, we have been also able to understand clients exact requirements.